H.H. NELSON, « Certain Reliefs at Karnak and Medinet Habu and the Ritual of Amenophis I. Concluded », JNES 8, 1949, p. 310-345 11 citation(s).  Ce document est consultable à partir d’un site extérieur nécessitant un abonnement ou un achat : http://www.jstor.org/stable/542898. p. 339-341 fig. 39 . H.H. NELSON, W.J. MURNANE, The Great Hypostyle Hall at Karnak, Volume I, Part 1. The Wall Reliefs, OIP 106, 1981 325 citation(s). H.H. NELSON, « The Rite of “Bringing the Foot” as Portrayed in Temple Reliefs », JEA 35, 1949, p. 82-86 1 citation(s). H.H. NELSON, « Certain Reliefs at Karnak and Medinet Habu and the Ritual of Amenophis I », JNES 8, 1949, p. 201-232 18 citation(s). H.H. NELSON, « The Identity of Amon-Re of United-with-Eternity », JNES 1, 1942, p. 127-155 1 citation(s). H.H. NELSON, Key Plans Showing Locations of Theban Temple Decorations, OIP 56, 1941 2 citation(s). H.H. NELSON, « Three Decrees of Ramses III from Karnak », JAOS 56, 1936, p. 232-241 3 citation(s).